OAKLAND, Calif. A San Francisco Bay Area commuter train returning from routine maintenance struck and killed two workers who were inspecting the tracks Saturday afternoon - an accident that comes amid a strike that has shut the Bay Area Rapid Transit system down to riders for the past few days. BART officials said in a statement that the manager who was operating the train was an "experienced operator," and the four-car train was being run in automatic mode under computer control at the time of the accident. Officials from the unions representing BART's train operators and some of the system's other workers have warned of the danger that could come with allowing managers to operate trains. The unions have been on strike since Friday. One system employee and one contractor were killed in the accident in the East Bay city of Walnut Creek shortly before 2 p.m. 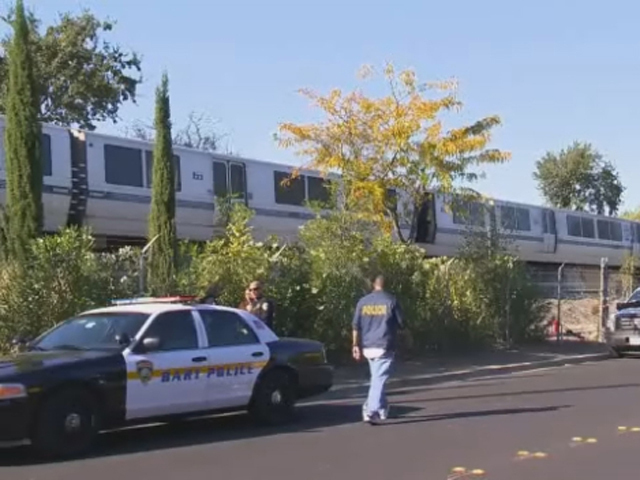 The train had been at a yard where workers had been cleaning off graffiti, BART officials said. "This is a tragic day in BART's history," the system's general manager, Grace Crunican, said in a statement. "The entire BART family is grieving." One of the unions on strike, Amalgamated Transit Union 1555, announced that its 900 workers would not be picketing on Sunday out of respect for the victims and their families. Also Saturday, ATU local president Antonette Bryant said she was taking a final contract offer from BART before members for a vote, but expects it will be rejected. "It's our hope we can get it to members this week," Bryant told The Associated Press in a telephone interview. She said she expects the vote to be "a resounding no." Bryant later issued a statement, saying Saturday's accident was a "terrible human tragedy." The two workers killed were performing track inspections about a mile from the Walnut Creek station in an area some 25 miles northeast of San Francisco, BART said. They were responded to a reported dip in the track. "Both people had extensive experience working around moving trains in both the freight train and the rapid transit industry," BART said. The procedures for such maintenance require one employee to inspect the track and the other to serve as a lookout for oncoming traffic, BART officials said. They did not immediately say whether that procedure had been followed. Police placed yellow tarps over the two dead who were about 150 yards apart on the tracks. The victim's names and ages were not immediately released. Oversier wouldn't address questions on the union's warnings about managers operating trains. "We're dealing with a tragedy," he said. "The labor issues are not in the forefront of our mind." The National Transportation Safety Board announced late Saturday that it has informed BART and the California Public Utilities Commission that the federal agency will take over the investigation. The deaths were the first of a BART employee in five years. In October 2008, about one stop down on the same line, 44-year-old BART employee James Strickland was hit him from behind while inspecting the tracks. Trains in both directions were sharing the same stretch of track at the time because of maintenance and Strickland had apparently been unaware. Before Saturday's accident, union leaders spent much of the day attempting to convince the riders who make 400,000 daily trips on the system that workers' demands are not unreasonable amid increasing hostility in social media and other outlets. The ATU agreed with BART management on the economic parts of the contract, including a 12 percent pay raise that when increased pension and health insurance costs becomes nearly a 1 percent salary loss for workers, Bryant said. The two sides came to an impasse over work rules, including the length of the work day and when overtime pay kicks in, the union said. BART spokesman Rick Rice said that the two sides remain in communication though they were not expected back at the bargaining table. Messages left for negotiators from the Service Employees International Union, which also represents workers, were not immediately returned. However, SEIU president Roxanne Sanchez said they were willing to sign off on pay, health care and pension issues, and send the remaining snarl - work rules - to an arbitrator, a proposal BART has previously refused. But BART officials later said they would be willing to send the entire contract to arbitration but not the work rules alone. Weekend BART use is light compared with the workweek, and frustrated commuters Friday said they hoped an agreement could be quickly reached. The system carries its ridership through tunnels under the bay and into the region's urban core of San Francisco from four surrounding counties, relieving what would otherwise be congested bridges. In an effort to alleviate delays, many of the Bay Area's other 27 transit systems added bus, ferry and rail service. Carpools and rideshare programs were also busy, and more cyclists took to the streets. Ferry operators said their ridership has doubled.